Cornelis Ploos van Amstel [1726-1798] (Lugt 3002-3), Amsterdam; (possibly sale, Amsterdam, van der Schley ... Roos, 3 March 1800, part of Album BBB, lot 49); Rudolph Weigel, Leipzig, 1838, no. 1187; J.A.G. Weigel, (sale, Stuttgart, Gutekunst, 8-15 May 1883, lot 445); William Mitchell [d. 1908] (Lugt 2638), London; (sale, Frankfurt am Main, Prestel, 7 May 1890, lot 54); A.W. Thibaudeau, Paris; A.S. Drey, Munich; F.A. Drey, London; (A. Strölin, Lausanne); purchased (via de Bayser) by Ian Woodner, New York, 25 July 1985; by inheritance to his daughters, Andrea and Dian Woodner, New York, 1990; gift to NGA, 1991. Master Drawings: The Woodner Collection, Royal Academy of Arts, London, 1987, no. 55. Master Drawings from the Woodner Collection, Metropolitan Museum of Art, New York, 1990, no. 67. The Touch of the Artist: Master Drawings from the Woodner Collections, National Gallery of Art, Washington, 1995-1996, no. 43, as. Ganz, Paul. 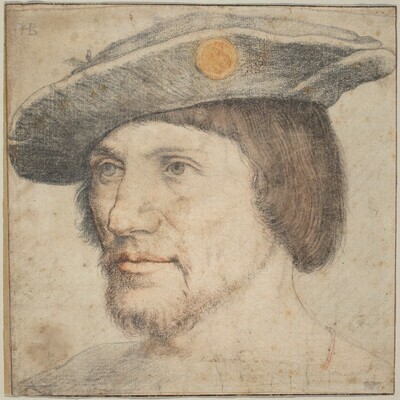 Les dessins de Hans Holbein le jeune: Catalogue raisonné. Geneva, 1939: I, no. 10. Béguin, Sylvie. "Andrea Solario en France." In Léonard de Vinci entre France en Italie: 'miroir profond et sombre'. Colloque international de l'Université de Caen. Caen, 1996: 90, fig. 8.